Click here for our new template page! Building a new web site? Or, want a re-design? 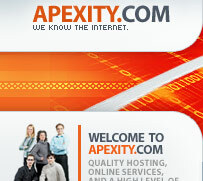 Apexity now offers 1000's of affordable web site templates that you can use to create a new web site, or re-design your current web site. Use the search tool to find your appropriate category, then choose your favorite design. - changing buttons or menu - $80. What's Included with the web templates? These web site templates are Photoshop templates. Each comes with the PSD file as well as an HTML file to show you how it can be modified and properly utilized. These website templates are designed to be able to be used in all popular web design software such as Front Page, Dreamweaver, Golive, etc... The provided HTML file is ready to be imported into your editor. If you would like to do more extensive modification you may use standard graphics programs like Adobe Photoshop, Corel Photo Paint, Macromedia Fireworks, Ulead Photo Impact, etc... to make changes to the PSD file. Can you make changes in the templates for me? For a fee of $150 USD we can integrate your existing home page, and one sub page into one of these templates. Additional pages are $35 each.